I’d like to thank everyone who came to the opening night of my exhibition at Core Realty and to thank Core for its generous hospitality and support. The turnout was excellent and I had a wonderful time! The show is open for viewing seven days a week from 11 am to 4 pm and continues until February 16. I’m really pleased to be showing a collection of my Oil Pastels and Pen & Ink drawings, at Core Realty, 747 Queen Street East in Toronto, from January 19 to February 16. Please drop by for the opening on Thursday January 19, between 7 p.m. and 10 p.m. And keep your fingers crossed for good weather! One of my new oil pastel paintings is included in the “Scapes” exhibition at the Propeller Centre for Visual Arts. The show runs from February 2 to 13. 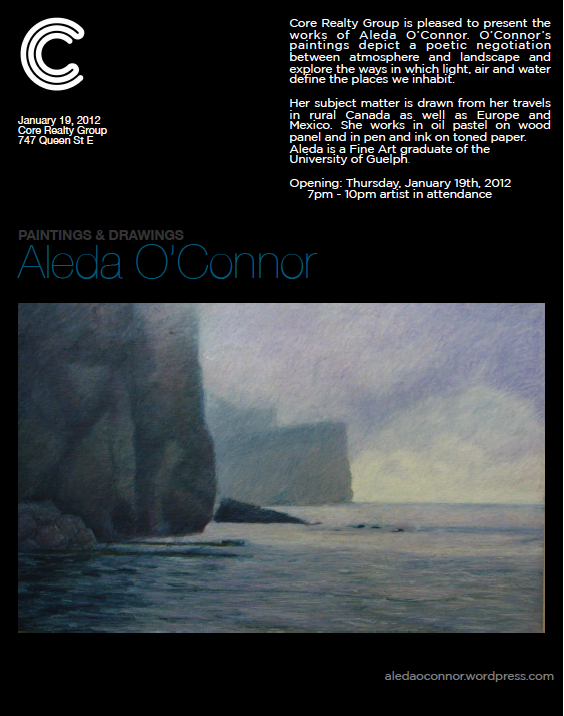 The opening reception is Thursday February 3 and runs from 7 to 10 p.m. Propeller is located at 984 Queen Street West, Toronto.